To understand the rising trends in inequality it is necessary to keep track how the 20% to 99.99% percentiles of the US population have changed since 1970. The accompanying chart shows that the compensation levels of the 99.99 percentile of the population grew cyclically at the annual rate of 4.1%, or for a total of 361%. The bottom 20% of the population grew only 10% in dollar (unadjusted for inflation at 0.3%/year) terms. According to FORBES, 2016 Special Edition, there were 1,810 billionaires in the world out of the total global population of 7.4 billion. Billionaires constitute 0.000024% of the total population. The total net worth of billionaires is $6.5 Trillion, or averaging $3.6 billion per person. According to Credit Suisse Global Wealth Report household wealth stood at $250.1 trillion in mid-2015, or $52,400 per adult. That makes billionaires holding over 2.6% of the total global economic wealth. About half of the global population were earning less than 0.0015% of the wealth of an average billionaire. The super-rich (e.g. billionaires) do not have 0.1% of the wealth of the world and not 0.01% of the wealth but only 0.0015% of the accumulated wealth. CONCLUSION: Since 1970 there has been a steady increase in income inequality. 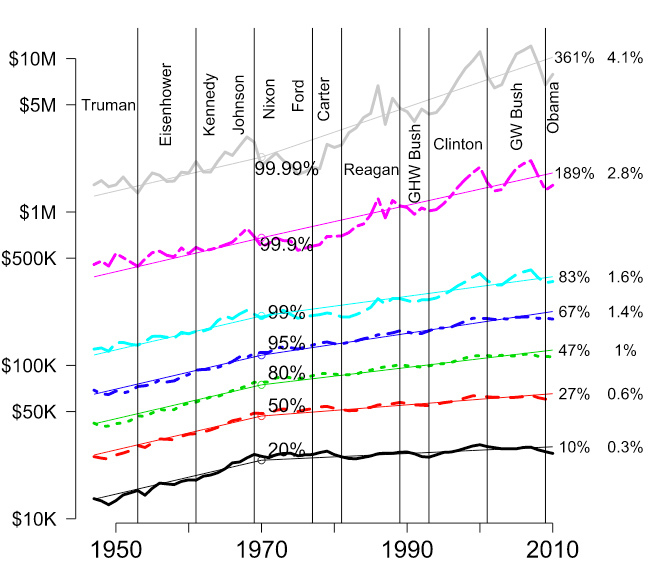 The largest gains for the the wealthy took place under the favorable growth years after 1990. At this point there is no known policy for bridging the gap between the global median wealth and the average wealth of 1,810 billionaires. For full disclosure I would prefer to supplement the annual FORBES listing with data about employment created by every billionaire.